(For me, this is “the” objective gathering of the brightest technical minds in the RTC space.) Robin Raymond will be speaking on ORTC / WebRTC 1.1 and also Cloud + P2P Communications. A few more changes to be made before we call for implementations, very, very close now. Should happen in next couple of weeks with new Editor’s draft. 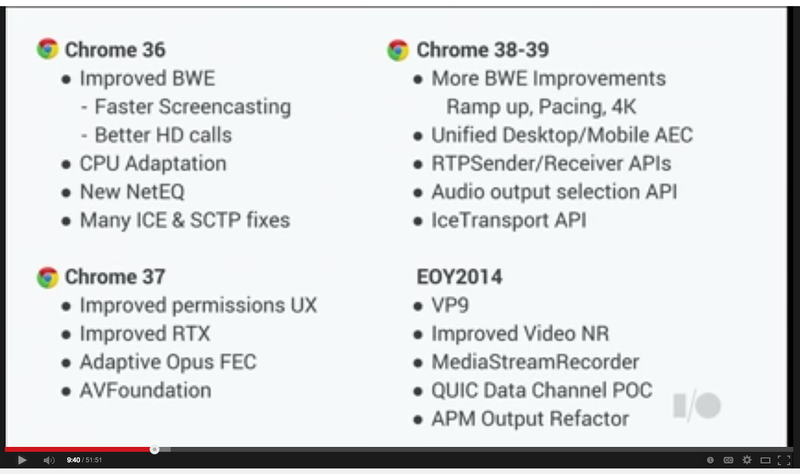 For those who missed it, Chrome 38-39 looks like it will be shipping with ORTC 1.1 RTPSender / Receiver APIs as announced by Justin Uberti at Google I/O 2014. This really should not come as any surprise as RTPSender / Receiver APIs are now on track for WebRTC 1.0 integration as well, as per the last W3C WebRTC WG Interim meeting.